Comments: Little is known about this cryptic species and it takes a special effort to locate it. Yellow Rails are rarely seen and best heard late at night. Their call sounds like two small pebbles being tapped together four or five times. They require flooded, dense cover such as fens, sedge, grass and hay meadows, stream floodplains and rice fields. During migration, look for Yellow Rails in moist agricultural land and upland grasslands in the eastern Great Plains. They are small, yellowish tan on the neck, chest, and upper belly and have a short, light colored bill. They have a striped back and in flight, large white trailing wing patches. 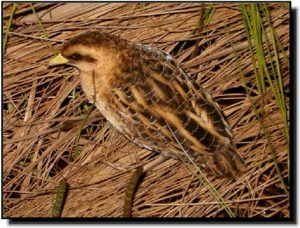 Yellow Rails breed in the northern Great Plains and winter along the southern Atlantic and Gulf Coasts. Several migration records in the Great Plains are from specimens collected after collisions with radio and television towers.